I promised my friend, Alex Byrne, that I would try her recommended skincare routine using Dr Hauschka products. Alex is a top makeup artist (you can see some of her work here) and I first worked with her about ten years ago. I’m pretty sure she was the first makeup artist to introduce me to one of Dr Hauschka’s cult products, the Rose Cream. The Rose Day Cream is a brilliant, rich cream that works wonders on dry skin – perhaps a little too rich for combination T-Zones, and definitely too rich for breakout-prone skin! (There is a lighter version, too, actually – find it here – but I still prefer the original!) It’s great, though, for prepping tired skin before makeup application. Massage it in thoroughly about fifteen to twenty minutes before you start putting on your foundation and it seems to create a smooth, plumped-up base. Anyway, fast-forward ten years and Alex is still proclaiming the benefits of Hauschka – she wants me to give up my usual routine for a month and use the products shown in the photograph above. A rinse off cleanser (or “roll” off, actaully, as you’re supposed to roll and press the product over the skin), a toner and the Rose Day Cream. Now, you know me – I can’t live without some kind of exfoliation, and so I have a feeling that I won’t even last it out a week, but I am interested to see what such a simple routine will do for my skin. I’m especially looking forward to the little Lavender ritual that Alex has suggested – adding a few drops of the Lavender bath oil to my water so that cleansing becomes more of a luxurious treatment. Nice touch! 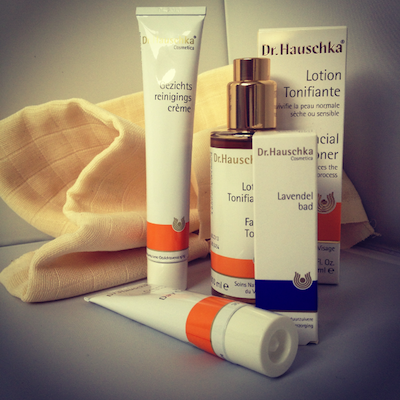 Dr Hauschka is available from BeautyBay.com with free worldwide delivery.